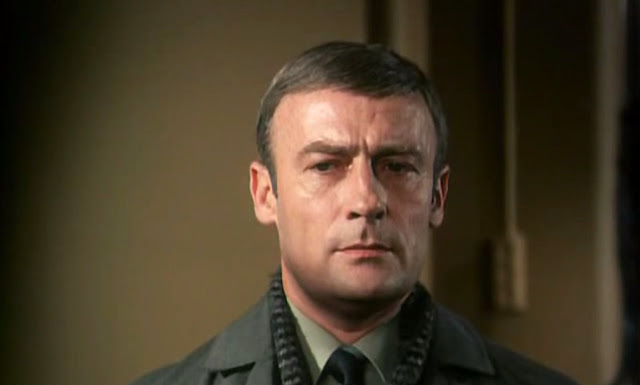 Edward Woodward as David Callan. In addition to his other responsibilities, Ripley works as a consultant for UK-based Ostara Publishing. So he was delighted to share with me the information that Ostara, under its Top Notch Thrillers imprint, has finally completed its republication of James Mitchell’s Callan series. Callan, of course, was created as a one-off TV drama in 1967, written by Mitchell. The character of David Callan, a surly but vulnerable and ferociously downbeat professional hit man working for a very dirty section of British Intelligence, struck an instant chord with the viewing public. As portrayed by actor Edward Woodward (later to star in The Equalizer), Callan went on to feature in a four-season ITV series (1967-1972), plus a 1974 theatrical film and a 1981 TV reunion movie, some 40 short stories syndicated worldwide in newspapers, and five novels. The opening sequence from Callan is embedded below. Top Notch editions of the Callan novels began to appear in 2013, and now the fourth and fifth volumes—Smear Job and Bonfire Night—are available in trade-paperback and e-book formats. First published in 1975, Smear Job is the longest and most densely plotted of the Callan yarns, featuring all the characters Mitchell created for “The Section,” his fictional (one can only hope!) government agency dealing in surveillance, blackmail, and even the assassination of anyone deemed to be a threat to national security. Callan’s sidekick Lonely, the cowardly and often pungent professional burglar, plays a key role here, as do Spencer Purceval FitzMaurice and Toby Meres. Even Section chief “Colonel Hunter” finds himself “in the field” as the story moves along at Mitchell’s typically lightning pace, transporting readers from Sicily to the London ganglands, Las Vegas to Mexico, and Cold War West Germany to England’s deserted Suffolk coast. Bonfire Night, the fifth and final entry in Mitchell’s series, was written more than 25 years later and published in 2002, the year of the author’s death. It has been out of print for the last 13 years and, with no previous paperback edition, rapidly became the most sought-after of the Callan yarns. The new Top Notch edition comes with a specially composed Introduction by the author’s son, Peter Mitchell, that describes the extraordinary circumstances under which Bonfire Night was written. To quote series editor Ripley: “Since the Top Notch Thrillers imprint was established in 2009 to revive and republish great British thrillers, we have had many requests from readers to reissue Bonfire Night—the ‘lost Callan’—far more than for any other title, and we are now proud to so. After long consultation with the author’s son, Peter, I have kept editing to the bare minimum so that dedicated Callan fans can read this … coda to the Callan saga as the author intended. It is something of a ‘difficult’ book as Mitchell tried to merge a typically serpentine plot with major developments in the lives of his main characters. Callan is now rich, in danger of falling in love, and living in retirement in his own personal castle in Spain, and the new Hunter heading the Section is a woman. The seismic character change, though, is for Lonely, who has (thanks to a prison education course) become a computer genius and software millionaire!